In the light of Atsushi Kuze joining Jupiter, his works with Concerto Moon have been receiving more than a few spins in my household. I have been fairly critical of Kuze’s competent, but somewhat Dokken-ish voice in the past, but there is one Concerto Moon album on which he is really pushed to his best performance thus far and that is ‘Savior Never Cry’. Of course, the fact that the band sounds at their heaviest and most aggressive here works miracles as well. The fact that their classy, hardrock-inspired melodicism is not sacrificed is an impressive achievement in its own right. Somehow, I think I prefer Concerto Moon without a keyboard player. 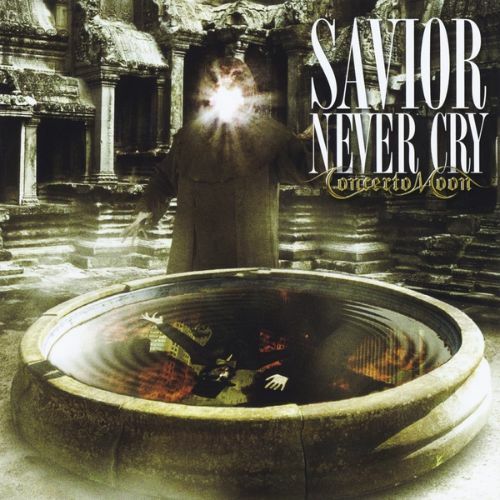 The keys are indispensable for their early progressive hardrock meets neoclassical power metal approach, but on ‘Savior Never Cry’, band leader Norifumi Shima’s riffing takes center stage. His sound appears to be just a tad heavier too, to the point where it’s hard to believe that he’s actually playing a guitar with single coils. This powerful, bottom-heavy sound really pushes Kuze to a performance that foregoes his usual gentle rasp in favor of a throaty, full-force approach that is not too dissimilar to what Yukio Morikawa does with Anthem. Concerto Moon certainly proves that the first strike is deadly. The opening title track of the album’s predecessor ‘Angel Of Chaos’ was already impressive, but ‘Savior Never Cry’ really has the band firing on all cylinders. Shima’s riffs are thick and tasteful, Masayuki Osada’s drumming is pulsating and punishing and Kuze is inspired to do some of his most intense screaming yet. The rumbling double kick work and heavy riffing is continued on the following ‘Straight From The Heart’, which I consider one of Concerto Moon’s most underrated tracks to date. Its eighties Dio-esque vibe is simply irresistible. From then on, the album does not get quite as heavy anymore, though the speedy closer ‘Slash The Lies’ – which inexplicably only is a bonus track – comes pretty close. The heaviness is hardly missed though. The fact that Shima (mostly) has to fill his end of the sonic spectrum by himself results in very powerful hardrock and heavy metal tracks like ‘Lay Down Your Life (To Be Free)’, ‘Over The Fear’ and the midtempo ‘In My Dream’. Even the ballad ‘Lovers Again’, often a weak point for Japanese bands, is surprisingly good. Only ‘The Shining Light Of The Moon’ is a little too watered down for my taste. Norifumi Shima and Concerto Moon were obviously on a roll around the turn of the decade. ‘Angel Of Chaos’ is one of the band’s best albums, but ‘Savior Never Cry’ ups the ante in terms of heaviness, compositional quality and vocal performance. After the release of ‘Savior Never Cry’, Concerto Moon would continue in a somewhat more hardrock-oriented direction. Quite accomplished hardrock too, but after being infatuated with the almost ‘Painkiller’-like intensity of this album’s title track, it’s difficult to settle for something else. ‘Savior Never Cry’ is highly recommended to anyone who longs for the time when hardrock and heavy metal weren’t two separate things yet. Within the visual kei realm, NoGoD is a bit of an anomaly. With a sound that is a lumpless blend of modern hard rock and heavy metal, they don’t really fit any of the trends that exist in their genre and because they are not a cast full of pretty boys – they are fronted by the clownesque Dancho – their fan base is largely male. With that different take on Japanese rock music, NoGoD is certainly a band to check out for those who are usually discouraged by the visual approach. And there hardly is any better place to start than ‘V’. Though NoGoD is mainly known for energetic, riffy songs with rather upbeat choruses, ‘V’ is notably darker in tone than any of their other albums. It is also slightly more metallic than their other works, though the catchy bits are almost all arena-worthy in their sing-along glory. The first half of ‘IV – Tasha / Philosophia’, the fourth part of a suite that stretches out over four albums, has a stomping 5/4 beat that many of their peers would not dare to attempt and the awesome ‘Sabbath’ is probably the darkest NoGoD song yet. Coincidentally, it is also one of their very best. In more familiar territory, ‘V’ also shines just a little bit brighter than the rest of NoGoD’s discography. While earlier albums had masterpieces like ‘Kamikaze’, ‘World Ender’ and ‘Kakusei’, ‘V’ just rolls on without ever losing steam. Sure, the more punky, upbeat songs ‘Kane wo Narase’ and ‘Pandora’ feel a little odd atmosphere-wise, but that is easy to accept on an album that also has fist pumpers like the anthemic ‘Stand Up!’ and ‘Zetsubo Bye Bye’. The album is even bookended by two tracks that are surprisingly riffy; the guitar work in opener ‘Utsushiyo Horror Show’ and closer ‘Tosohonno’ is almost speed metal in nature. Dancho’s voice is the thing that seems to spark most debate amongst people who are not sure if they like NoGoD. While that is understandable – the fact that he is almost exclusively in full-on passionate mode does not account for a lot of dynamics – Dancho is probably the factor that makes NoGoD stand out in a scene full of Kamijo and Gackt soundalikes. I like him a lot. Dynamics and subtlety are built by the tastefully layered interaction between guitarists Kyrie and Shinno. Kyrie even has one of his many acoustic solo pieces here in the shape of ‘Yume No Awa’. A perfect little break between intense songs. Although the criticism that the visual rock scene is full of bands that blindly copy each other in terms of musical style and appearance is justified, once in a while a band pops up that can truly deliver in terms of originality and playing. While NoGoD doesn’t really do anything new, the band doesn’t really sound like any other band inside of Japan and outisde. And they still don’t, despite the fact that their recent albums lean towards modern rock a little too much. If you like great riffs, passionate vocals and a tight rhythm section with a thick bottom end, NoGoD should be right up your alley. 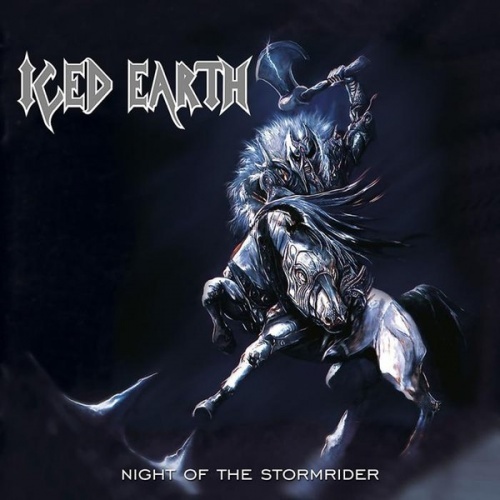 ‘Night Of The Stormrider’ is often mentioned as a favorite by those who followed Iced Earth from the very beginning and it is easy to hear why. The song material is notably more complex than the songs that would make the band a big name less than a decade after its original release in 1991, though there is more of a polish than on the self-titled debut. The fact that it’s a concept album certainly helps its continuity as well. Whatever happened in the intervening year, it helped. Most of the songs would remain live staples for many years to come. Whether or not ‘Night Of The Stormrider’ would be your favorite Iced Earth album depends on what you want to hear from them. If you want the hooky choruses and dramatic vocals that are currently synonymous with them, the album may come off disappointing. Jon Schaffer’s trademark aggressive, hyperspeed palm-muted riffs are all over the record though. And there’s certainly a higher riff density than usual. Verse-chorus structures are broken up by extensive middle sections full of tempo and atmosphere changes, while the overall tone of the album is notably darker than most of the band’s other output. Compositionally, the album contains some of Iced Earth’s finest work. Especially when the band combines fierce aggression and the first traces of theatricality, as is the case in the massive opener ‘Angels Holocaust’, Iced Earth proves they were easily among the best metal bands of the early nineties. Closing epic ‘Travel In Stygian’ manages to wrap up all the elements of Iced Earth’s style as well, with fierce semi-thrash riffs, balladesque sections and a particularly climactic chorus following each other seemlessly, though it could have used a shorter middle section. ‘Stormrider’ and the more melodic, oft-forgotten ‘Mystical End’ are more concise, but no less impressive. Another song that doesn’t always get the praise it deserves is ‘Desert Rain’. It is easily the darkest moment on the album musically, with the rage and confusion of the lyrics perfectly illustrated by the juxtaposition of forceful metal and more desperate tranquil sections. Its chorus is one of the band’s first experiments with vocal harmonies and it is quite tasteful. If you’re splitting hairs, you could argue that the song is more a collection of riffs or segments than a composition, but that is the case for ‘Pure Evil’ as well and that one is still a fan favorite to this day. The album is not without its flaws. First and foremost, John Greely is merely adequate, though significantly better than his predecessor Gene Adam. His cleans have a pleasant tone and his rawer work sounds delightfully aggressive, but his high-pitched screams lack character and his range is quite limited. The acoustic interludes ‘Before The Vision’ and ‘Reaching The End’ don’t add much musically and some sections (most notably the parts before the final verses of ‘The Path I Choose’ and ‘Pure Evil’) sound too similar. The pros outweigh the cons though. Unlike Schaffer, I think the bottom-heavy production benefits the music and there is a simple reason why a majority of these songs are considered Iced Earth classics: they’re very good.